"Can we get extra pickles with that?" My fellow American-in-London friends agree (I refuse to be known as that dreaded word, "ex-pat") that Byron does the best burgers in town - that is, the closest to American burgers in town. The buns aren't on artisan bread nor do they crumble and disintegrate in your hands within the first few bites: they're just good. 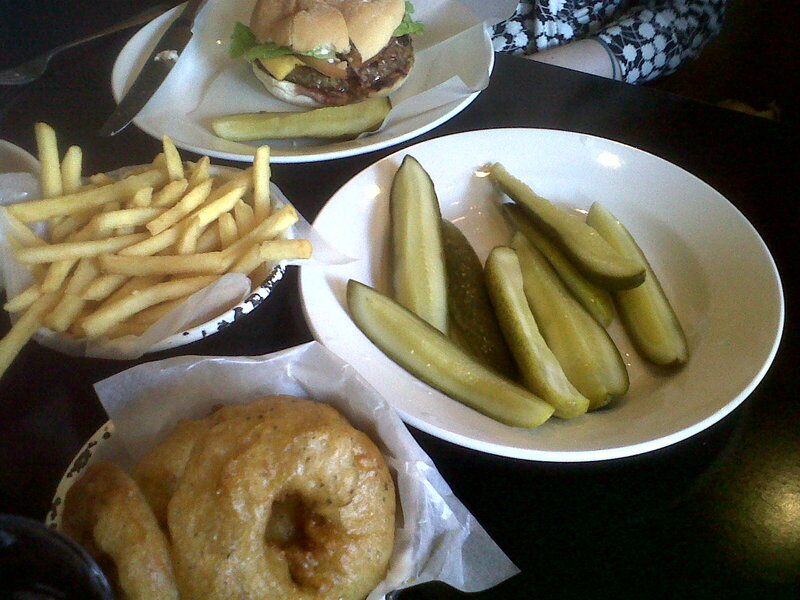 Plus, they serve skinny fries and gigantic onion rings - just the way we like them. But the real zinger? The pickles. Nearly like Claussen's (but not). Any new American to London will bemoan the lack of crunchy, salty, tart, pickles here in the UK - instead, little sweet "gherkins" the size of my pinky finger are pitifully served aside a Ploughman's lunch. Not satisfactory. But Byron knows the secret to a pickle-lover's heart: in fact, I emailed the MD of Byron, Tom Byng, about his pickles. 'Where DO you get them pickles? ', I inquired. He wrote me a jolly email back responding that, unfortunately, the pickles are only available on a wholesale basis. Well, not a problem, really. I'd be happy to eat them by the truckload. Anyway, on Friday, accompanied by two of my favorite ladies, we waltzed into Byron and demanded (or rather, one of us did the work) extra pickles. I was expecting an extra one per plate. The result? That beauty up there. We split the last one into three parts. We're just fair like that. Excellent, excellent, excellent. I love pickles too and just might have to finally go to a Bryon. You must! I normally stay away from chains, but the pickles lured me in.